We're experts at corporate identity pieces. But that's only the beginning. When it comes to business communications services, we've got it covered. We can provide virtually any product or service imaginable to communicate with your clients, employees, stockholders, or vendors. To learn more about the many products and services we offer, please contact one of our representatives or click on our Shop Minuteman link http://www.minutemanpress.com.au/our-products/?store=liverpool#top to view the full range of of great online featured products. Alternatively, click on the images below to find out more about some of our additional products shown on this page. The links will take you to a number of our other corporate partners. Once you identify the product you are after, write down the catagolue number then click on the 'Request an Estimate' menu on the left side of this page or click on the green 'get a quote' icon on the Minuteman Press home page. 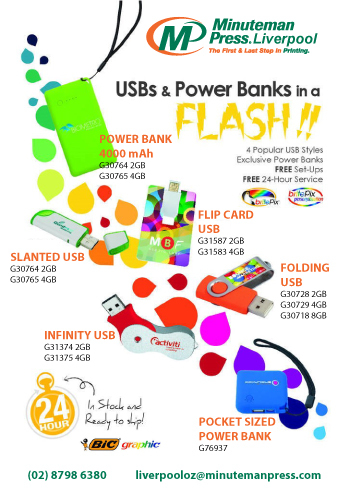 Remember, we can place your logo and text on these products so that you get maximum impact! Click on the image to find out more. Identify the product you are after and write down the catalogue number then come back here to click on the Request an Estimate menu (left) to get a quote. 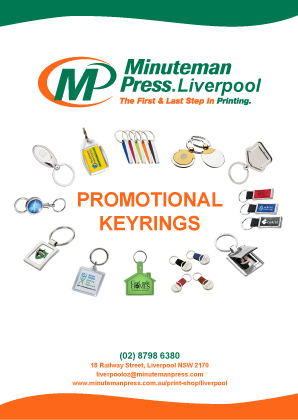 Click on the image to download a copy of our promotional keyrings.